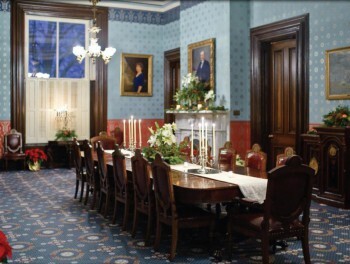 The Missouri Governor’s Mansion was completed in late December 1871. The mansion was built in only eight months, with much of the work performed by prisoners of the nearby penitentiary. The cost, including some of the furnishings, was $74,960. 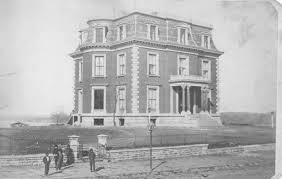 Governor B. Gratz Brown and his family moved into the mansion on January 20, 1872. 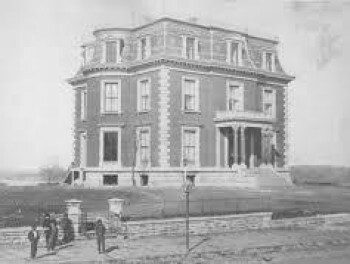 The mansion was designed by noted St. Louis architect George Ingham Barnett who was born in Nottingham, England. He immigrated to the United States in 1839 and spent most of his years in St. Louis as a partner in the architectural firm of Barnett and Piquenard. Mr. Barnett also designed the Henry Shaw House, which is located on the grounds of the Missouri Botanical Garden. The style chosen for the mansion was the most popular of its time and was known then as the Mansard Style, named after the steep roof with a low upper roof in which it was possible to create useful living space. This roof was named after Jules Hardouin-Mansart, a French court architect of the 17th century. It has also been referred to as Renaissance-Revival Victorian. The original three-story structure was built containing 13 bedrooms, no bathrooms or closets. The builder was Gottlieb Martin. The entry consists of an imposing portico with four dignified pink granite columns. The unique home is 66 1/2 feet square with apsidal ends. The mansion design is an elegant example of second Empire architecture. 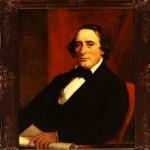 The columns were given by Governor B. Gratz Brown, however, they arrived nine inches too short. In order to be placed where they are today, a base was constructed to elevate them to the requisite height. 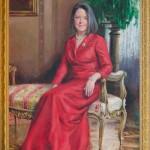 The gesture began a tradition a Governors and their wives leaving a lasting gift to the mansion. 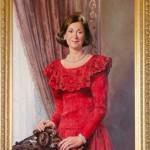 First Lady Dalton declared “To live in this house is to have a handclasp with history. You can’t live there long and not grow to love the building.” She is known to have “made friends with the old house” and became one of its strongest advocates. Mrs. Dalton restored and secured antique furnishings, wallpapered rooms, refinished the front doors and the gold leaf parlor set. She appealed to a legislative committee for an historical overseer of the house to provide continuity between administration, but was turned down. 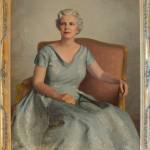 Mrs. Dalton helped set the tone for later restoration efforts. 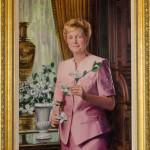 First Lady Betty Hearnes had a passion for preservation of the mansion. It was a leaky roof that prompted Mrs. Hearnes to make the mansion more livable. She helped remove over 35 coats of white paint from the exterior of the building. 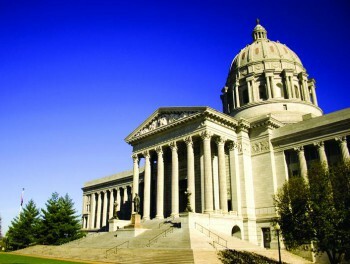 She secured $116,000 of appropriations from the Missouri legislature to repair the ornamental ironwork, slate roof, wooden cornices and window casements. Mrs. Hearnes also discovered the original interior window shutters that had been hidden within the walls and painted over. She said “the shutters unfolded like a butterfly from a cocoon.” More window and door shutters uncovered on the first and second floors were stripped of paint and stained to match the woodwork. She continued to refurbish brass chandeliers, cleaned the portraits of the first ladies, planted a rose garden, repaired the back porches and fireplaces. 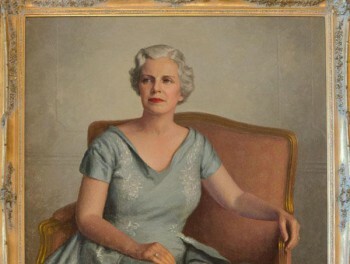 By addressing many of the mansion’s structural problems, Mrs. Hearnes paved the way for extensive interior restoration by the First Lady Carolyn Bond. 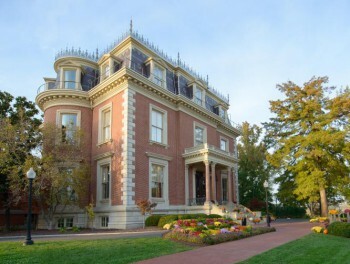 In 1974, Missouri Mansion Preservation (MMP) was founded by First Lady Carolyn Bond as a non-profit organization to preserve and restore the Missouri Governor’s Mansion and provide heritage educational programs. In 1976, Mrs. Bond was instrumental in raising $75,000 funds to restore the library and used her flair for design to recapture the Victorian period. Mrs. Bond raised nearly two million dollars in private and corporate funds for restoration efforts and launched a room-by-room improvement effort. Mrs. Bond donned overalls and climbed the scaffolding to help with the stencil work on the ceiling. Mrs. 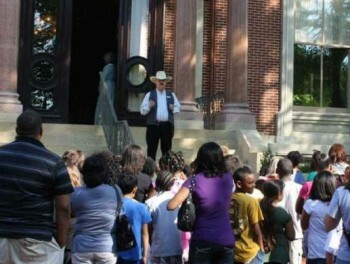 Bond formalized the “Docent Program” comprised of community volunteers in period costumes to share the history of the mansion during public tours. 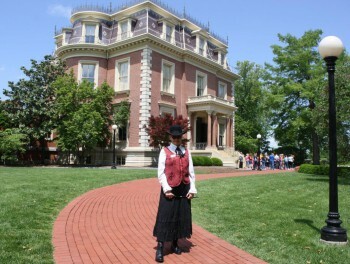 She opened the mansion for regular tours for all Missourians to enjoy. grillwork, and restoring its sagging ceilings. 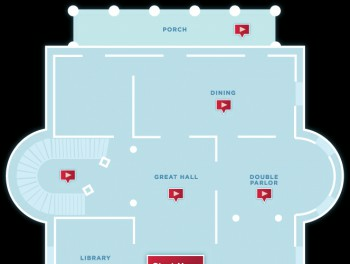 She also revamped the dilapidated basement entry, staff and security offices, first-floor restrooms, second-floor study, and the back stairway to the ballroom. 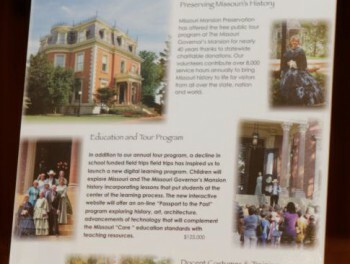 Mrs. Carnahan was instrumental in raising the funds for the fountain featured in front of the mansion, to offer a continual reminder of Missouri’s children. First Lady Melanie Blunt successfully lobbied the Missouri General Assembly for $3.1 million in funding for mansion restoration projects. Mrs. Blunt said “As part of the restoration efforts we are recapturing the original design of the roof based on the first available photo of the Mansion; returning the mansard roof to its original design adds to the historical significance of the restored work and will help ensure the mansion remains a resource for Missouri to enjoy for generations to come.” She also hosted the Luncheon with the First Ladies, the first-ever event bringing together Missouri’s First Ladies for a common cause.